Top Prospects Game hosts and, in advance of the event, announced the creation of the Pat Quinn Legacy Fund at a press conference today in Vancouver. The 2016 event will be held at Pacific Coliseum on Thursday January 28, 2016. The 21st annual showcase will feature the CHL’s top-40 NHL draft eligible players featuring talent from the Western Hockey League, Ontario Hockey League, and Quebec Major Junior Hockey League competing before hundreds of NHL scouts in attendance. The Giants also announced the creation of the Pat Quinn Legacy Fund which will be comprised of a number of different initiatives in honour of the late Giants co-owner including a scholarship that will support former hockey players who want to pursue advanced legal studies — a cause that is very close to the heart of the Quinn family. The Club also announced that proceeds from the 2016 CHL/NHL Top Prospects Game will go to the fund. Quinn, who passed away November 23 after a lengthy illness, captured a Memorial Cup as co-owner of the club in 2007 and also as a player with the Edmonton Oil Kings in 1963. Among his many contributions to hockey, Quinn also coached in the 2012 CHL/NHL Top Prospects Game in Kelowna. 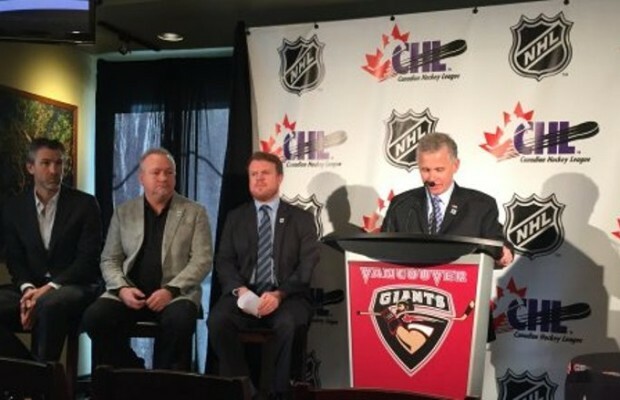 The Club also confirmed that tickets to the 2016 CHL/NHL Top Prospects Game will be included in the Giants’ season ticket package for the 2015-16 WHL season. For further information, fans can visit www.vancouvergiants.com or call 604-4-GIANTS (604-444-2687). Next season will mark the eighth time the game will be hosted by the WHL and second time the game will be played in Vancouver following the 2005 event. Since joining the league in 2001, the Giants have had nine players compete in the event with four of them chosen in the first round of the NHL Draft the same season. That list includes Mark Fistric (Dallas Stars 2004), Gilbert Brule (Columbus Blue Jackets 2005), Jonathan Blum (Nashville Predators 2007), and Evander Kane (Atlanta Thrashers 2009). Brule remains the only player in event history to record a hat-trick and also added an assist on home ice in 2005 where he was named Player of the Game captaining Team Cherry to an 8-4 victory over Team Davidson. Since the event was first introduced in 1996 the game has featured 12 players that were selected with the first overall pick in the NHL Draft including Chris Phillips, Joe Thornton, Vincent Lecavalier, Rick Nash, Marc-Andre Fleury, Patrick Kane, Steven Stamkos, John Tavares, Taylor Hall, Ryan Nugent-Hopkins, Nathan MacKinnon, and most recently Aaron Ekblad of the Barrie Colts selected first overall by the Florida Panthers. Ekblad, who captained Team Orr last season, was the first of 17 CHL players who competed in the 2014 CHL/NHL Top Prospects Game to be selected in the first round of the 2014 NHL Draft. He was with Team Cherry Captain Sam Reinhart of the Kootenay Ice selected second overall by the Buffalo Sabres. This season, 32 of the top-60 ranked North American skaters eligible for the 2015 NHL Draft competed on January 22 in St. Catharines. Top ranked Connor McDavid (Erie Otters) captained Team Orr to a 6-0 victory over Team Cherry that featured fellow Otter and fifth ranked skater Dylan Strome, and seventh ranked skater Mitchell Marner of the London Knights. The 2016 CHL/NHL Top Prospects Game was proudly supported by associate sponsors SUBWAY, Cooper Tires, autoTRADER.ca, and Sherwin Williams. The game will be broadcast live across Canada on Sportsnet and TVA Sports. For more information about the event please visit www.chltopprospects.ca.